Last week was my first CSA share! I couldn’t wait to run home and see what my husband picked up. I thought he got a pretty nice share for our first week. 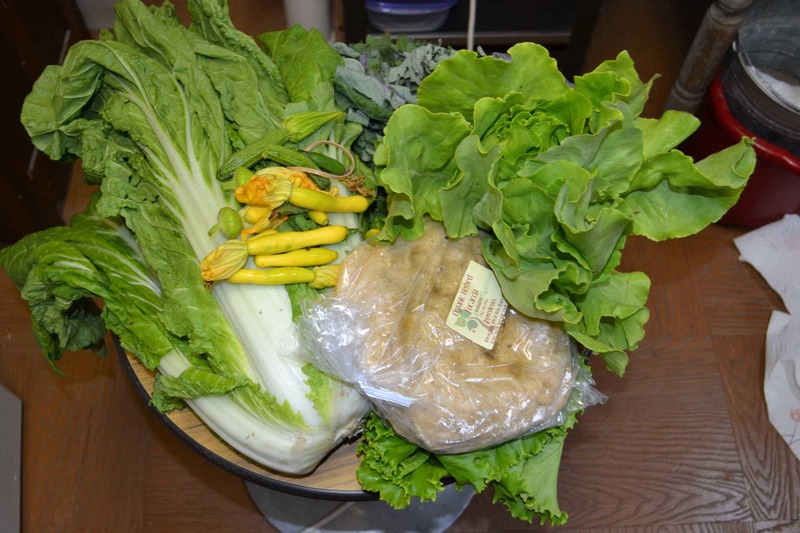 He received 2 heads of lettuce, 1 giant thing of Bok Choy, another green, zucchini blossoms, and 2 large herb focaccia breads. Since we were having a cheese plate for dinner I quickly cut up one of the focaccia and we ate it with our cheese. It was awesome and had hints of herbs and garlic. I used the lettuce in salads and it was really good. The thing I was having trouble with was the bok choy. I’ve made it before a few times but it’s never been my favorite. So I started looking in my cooking magazines for a recipe that used the bok choy. What is your favorite cooking magazine? Do you have one? I have several that I enjoy looking at whenever I have time. My favorite copies to flip through are Cooking Light and Taste of Home. On the Internet I love looking at Cook’s Illustrated. Whenever I need a recipe and don’t have time to research different versions I turn to Cook’s Illustrated because I’ve never had a recipe from here that didn’t work. Cook’s Illustrated is part of America’s Test Kitchen which not only gives you the recipe but explains why it works. I enjoy reading about how recipes are put together and why they work as they are written. Recently I’ve begun to watch both Cook’s Country and America’s Test Kitchen on Maryland Public Television. I love watching them whip up recipes and do blind taste testings on TV. 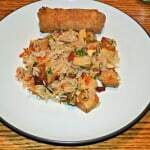 So when I had tofu out for dinner but I didn’t want to make any of the usual recipes I looked to Cook’s Illustrated for a recipe. 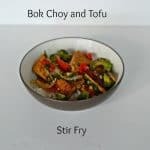 I found a stir fry recipe using bok choy in a ginger sauce. 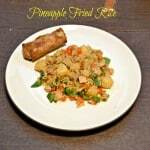 I tried it out and as usual, it was delicious! The sauce was full of flavor and had just a touch of sweetness. The bok choy, broccoli, and carrots added some color and crunch to the stir fry. As a bonus, this recipe is vegan so we can serve it when we have our vegan friends over for dinner. Combine all ingredients for the sauce in a medium bowl and set aside. 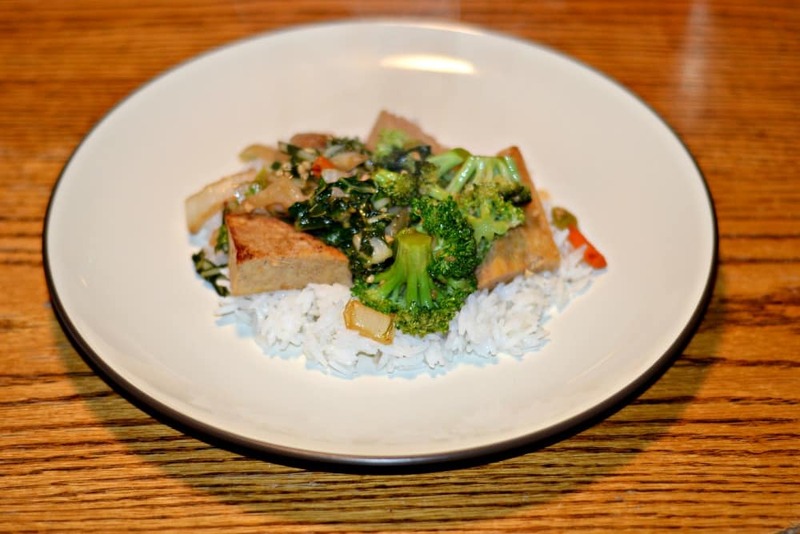 Cut the drained tofu into 5 slices and then each slice into 4 pieces. 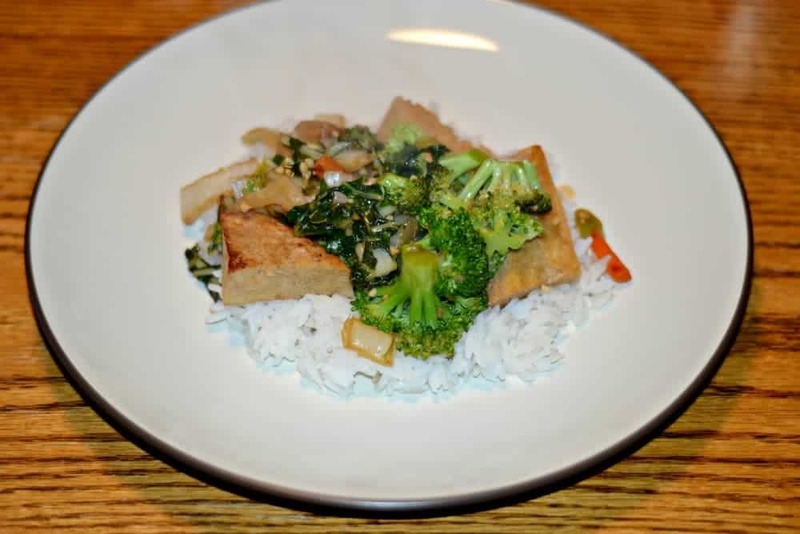 Spray a large skillet with cooking spray and cook the tofu for 5-7 minutes per side or until browned. Add the soy sauce, sherry, garlic, ginger, and 1 tablespoon of olive oil. Add in the bok choy and cook for 3 minutes. Add in the carrots and broccoli and stir fry for 5 minutes. Pour the ginger sauce into the sauce and cook for 2-3 minutes. Sprinkle with red pepper flakes. 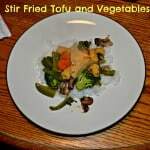 Divide the rice between 4 plates and then top with the tofu stir fry. Sprinkle with scallions and serve. I have zucchini blossom envy. Oh I love them! I’ve only ever fried them. How do you cook them? Hillary Davis has a great-sounding recipe in her book Cuisine Nicoise that I’ve been dying to try, but I can never find the blossoms. She makes a stuffing by sautéing onion, garlic, and grated zucchini, then (off-heat) she adds basil, Parmesan, egg, and salt & pepper. She bakes the stuffed blossoms and serves with homemade tomato sauce and more cheese. Oh my that sounds amazing! I’ve got to try that!